Coral World is the only theme park on the US Virgin Islands, an open ocean marine park with indoor and outdoor exhibits. 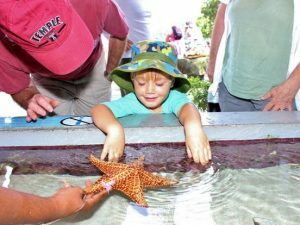 There you’ll find activities, adventures, animal encounters, dive experiences, feedings, presentations, and lots of fun. It’s all highly integrated with the ocean, almost completely natural rather than Disneyfied. Even though they are still recovering from the recent hurricanes, they do a remarkable job! I’ve never before seen an aquarium that gets you so close to the action. You’ll find aquariums, outdoor pools, an Undersea Observatory Tower, and so many adventurous and animal encounter experiences to check off your bucket list! We tried two different kinds of underwater voyage, snuba and Sea Trek, and then got in the water to swim with a sea lion and a sea turtle. It’s all within an easy walk from Margaritaville, which has the best restaurant on St. Thomas, and Coki Beach, which has the best beach snorkeling on St. Thomas. The small park has a touch pool with sting rays, and a touch pool with starfish and sea urchins. There’s a little pen for turtles. Our favorite was the mangrove pool that shows how mangrove trees have roots that go deep into the water and underground, and those roots become homes for sea life. There’s a decorative outdoor area with tables for lunch and plenty of shade. They have a gift shop, an ice cream bar, and a snack shack called the Shark Bar. At the Shark Bar you’ll find popsicles, smoothies, gelato, beer and rum, chips, salad, french fries, muffins, danishes, hamburgers, and sandwiches including a BLT, chicken breast, and grilled cheese. You’ll definitely see wild iguanas of all sizes roaming around, too. They also have an extended, covered deck that juts way out into the ocean. We just sat on the deck, in the shade, feeling the breeze and enjoying world class views of the ocean and islands. From there you can see the snorkelers at Coki Beach. Then you can take stairs down, below sea level, to an air-conditioned underground area where you can see out into the sea. That’s the Underwater Observatory. There they’ve got displays on pirates, shipwrecks, and ocean life. We saw some giant trout down there and a whole bunch of multicolored fish. It’s nice just to sit and admire the view in between activities. The activities, though, are the highlight of Coral World. First, we tried snuba. Snuba is a kind of scuba diving that requires no experience, because you don’t go that deep and you don’t wear a tank on your back. Instead you breathe through a hose that snakes all the way up to the surface. You then get to swim through a semi-closed undersea area about 20 feet down, a few yards from shore. It’s the same area that you can see from the Underwater Observatory. We had a great time with Glen, our instructor. He’s quite a comedian and made a lot of jokes, putting us at ease. 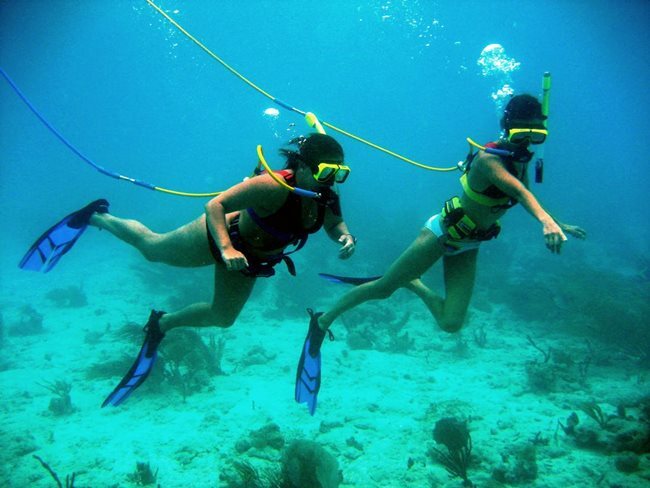 Although they say there’s no experience needed to do the snuba, you do need to be comfortable swimming at a B level (you do not need to be an athletic swimmer), treading water, swimming with fins on your feet, and clearing water out of a scuba mask. Glen showed us everything and we had such a great time exploring. Staff were accommodating and we got a ton of photos and video, too. While snuba diving, we didn’t see anything too exotic, but we did see very large fish, the size of a human child, a step up from the medium and small fish we’d seen elsewhere. They swim so close to you! 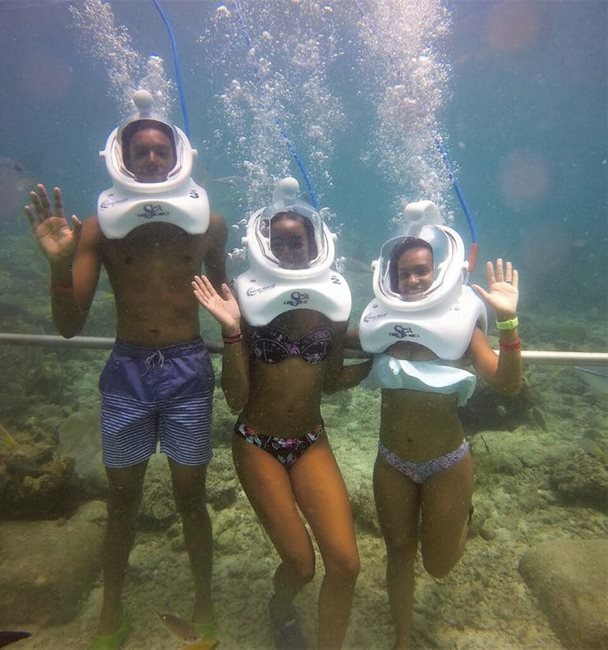 Personally, I preferred the snuba because I can swim comfortably, but my guest preferred Sea Trek, a similar experience that requires even less training and comfort in the water. You know how when you put a drinking glass upside down in water, that the air stays in there? That is Sea Trek. They give you a helmet that keeps some air, and gets fed air from a hose going up to the surface. Then you just go walking around on the sea floor. No experience is needed and almost no training. It takes place in the same part of the near-shore ocean as the snuba. For the sea trek, our guide was Mike, with Devin taking photos. 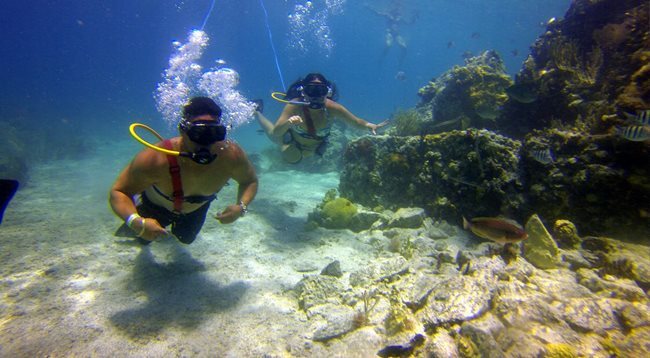 There are pros and cons to Sea Trek versus the similar SeaVenture at Discovery Cove in Florida (5 stars). At Discovery Cove, it’s only a man-made environment, but that means there are no currents, a completely flat walkway at the bottom of the pool, and they made sure to stock the pool with a great variety. 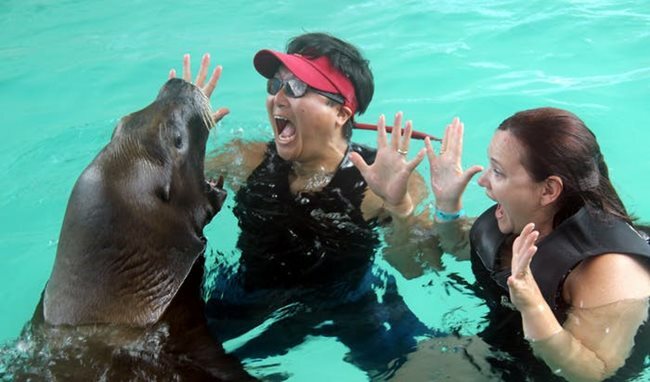 At Coral World, you’re going into the real ocean, so the animals you see will be wild ones, real encounters. But you’ll need to watch your step, and if there’s an ocean surge, you will get tossed around. We happened to come on a day with a powerful current, and had at all times to hold the safety railing that runs along the entire course. Whereas with the snuba, in the same part of the ocean, we didn’t feel it as much because you’re just moving with the water. Also, with Sea Trek, our helmets had a sharp angle on them, affecting the angle of light and how clearly we could see, like when you put a straw into water and the straw looks bent. It was weird to look around, and you couldn’t use your peripheral vision at all. But, I think we got used to it after a while, and we saw plenty of fish. Staff were accommodating of special requests and helped us through any anxiety we had, without making us feel bad not to be athletic. It was fantastic that they had staff to take photos of us in both experiences. You’ll see some great fish, too, of all sizes and colors. Amazingly, that’s not all at Coral World! We then got to swim with sea turtles. 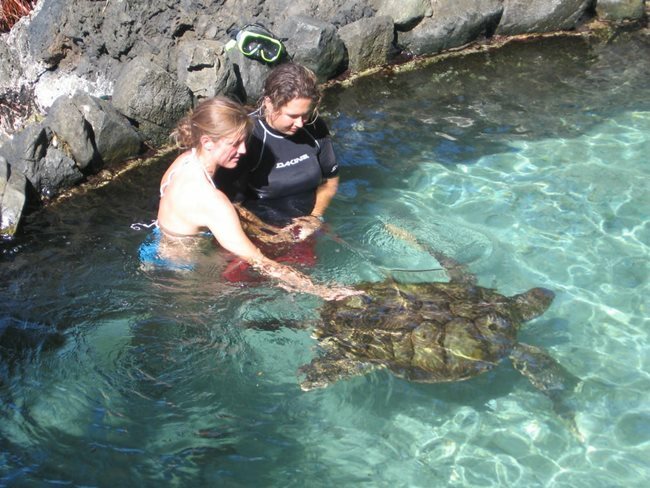 By this I mean, you change into a bathing suit and wade into the sea turtle pool and get to pet it. Our excellent host was Ryan. Before the swim began, he went through a picture book with us and taught us about the turtles. He was creative and accommodating to our crazy requests to shoot video and photos. Even though it rained in the middle of our training, and our photographer retreated, we had great fun. We also got to swim, in an indoor pool, with a sea lion! Staff took professional photos of us shaking its hand, petting it, and swimming with it, and I got knocked aside so easily when it decided to swim right through me! Although we didn’t get to see it, Coral World also has a nautilus semi-submarine! 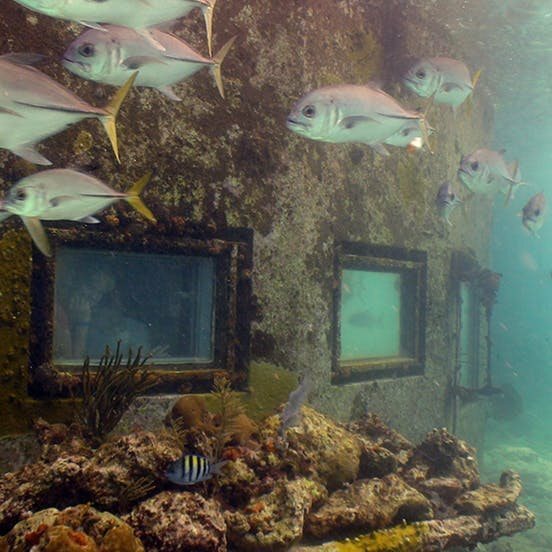 It’s like a glass-bottom boat where the top part of the boat is above water, but 30 people get to sit in the bottom part “underwater”, admiring sea life. And as part of their rebuilding after the recent hurricanes, they are adding dolphin interaction experiences and possibly a shark swim! Staff say that every time you visit, depending on which animals you meet, you’ll have a different experience. Staff were generous with their time and high energy, eager to share the ocean with us. Coral World also plays an important role in conservation efforts in St. Thomas. I’ve spent 14 years reviewing strange and wonderful events for Events INSIDER, and I can tell you that there’s nothing like Coral World and the animal encounters there. We preferred it to Discovery Cove, Sea World, and the Miami Seaquarium. It is warm rather than corporate, and so inviting and fun! Especially in the context of St. Thomas, a small destination, it is a must-see for every visitor to the island. I’m glad to give Coral World my rare 5 stars PLUS. Here’s some video of our snuba, Sea Trek, and swims, showing the Events INSIDER website to sea creatures.